Southwest Airlines today published its bookable flight schedule through March 6, 2019, bringing additional options for Customers traveling nonstop between North Texas and a half-dozen cities, as well as additional service on popular routes currently served from Dallas Love Field. The publication of the larger January/February flight schedule also brings back wintertime seasonal service from coast to coast…and to the Caribbean! Beginning January 7, 2019, Southwest® will add nonstop service daily between Dallas (Love Field) and newly available or previously offered cities of Charleston, Ft. Myers/Naples, Jacksonville, Louisville, Milwaukee, and Minneapolis/St. Paul, and seasonal service on Sundays to/from Tucson. 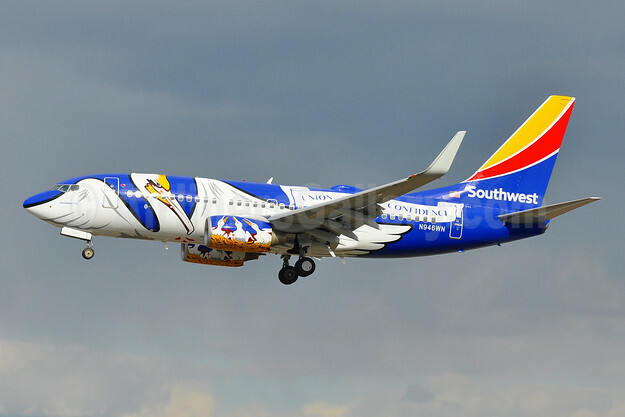 Copyright Photo: Southwest Airlines Boeing 737-7H4 WL N946WN (msn 36918) (Louisiana One) BWI (Tony Storck). Image: 941356. This entry was posted in Southwest Airlines and tagged Boeing 737-7H4 WL, Louisiana One, msn 36918, N946WN, Southwest Airlines on June 28, 2018 by Bruce Drum.